Jan Berg’s Westside home is designed to be free of gutters, with the water from the roof running off into the obsidian-covered system of trenches that hold water and pipes that direct it to the rain garden. For many urban residents, thoughts of rain center around how often the lawn needs to be mowed and flowers watered rather than the impact on storm sewers and the environment. Until, of course, streets, yards and homes are flooded. But for those, like Jan Berg and husband Rod Kruse, who see the importance of being stewards of the land — even as city dwellers — rain needs to be dealt with in an environmentally friendly way. They — and a growing number of metro residents — are making changes to their property, while local government is supporting the efforts with cost-sharing programs that help pay a portion of the projects. Berg and Kruse completed their projects in 2013. “It was the right thing to do as stewards of the land,” says Berg. “It helps avoid water runoff and erosion and reduces the strain on the storm sewer system.” The recent flash floods point to the need of such efforts, she says. “Holding water on our land is important,” says Berg. From the native prairie grass that covers the lawn to the rain garden, porous pavers and a water retention system, Berg and Kruse have maximized their ability to retain water on their lot. 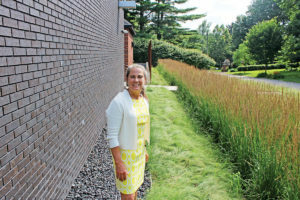 Rather than the grass traditionally seen on urban lawns, Berg and Kruse planted natural prairie grasses which grow to about 2-feet tall and have “a nice finished look,” says Berg. They chose buffalo grass and blue grama for their long roots, making them ideal for preventing runoff and erosion. “They also do not require watering — but that’s another conversation,” says Berg. The two grasses pair well together, she says. “They each have a different personality and deal with temperatures differently,” she says. A 3-foot by 3-foot trench was dug around the base of the house to collect the water that runs off the roof, which does not have gutters attached. The trench is filled with various levels of different materials so the water “percolates” through them before entering a perforated pipe that directs excess water into the rain garden at the front of the home. The system’s levels include pond liner, perforated drainage pipe, large rocks filled in with pea gravel, metal landscaping mesh and a topping of obsidian. The shiny black obsidian provides an attractive landscaping element. 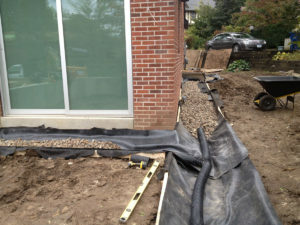 A pond liner is put at the bottom of the trench that encircles the home and captures storm water to divert it to the rain garden. Berg and Kruse’s rain garden is 24-feet long, 3-feet wide and 5-feet deep, partially filled with 3 feet of compost and sand. Growing in the ditch-like detention area is Karl Foerster feather reed grass, which can hold a lot of water and provides a decorative landscaping element. Porous pavers are featured on the driveway, back patio and walkways on Berg and Kruse’s property. They participated in a cost-share program for the pavers through their soil and water conservation district, which helped them plan their projects. About: The City of Des Moines has provided a rebate to property owners that install stormwater BMPs. The City will make a reimbursement for 50 percent of the cost up to $2,000 to property owners who meet the requirements of their program. Application Process: To receive the stormwater BMP rebate, applications must be approved before work has begun. Applications can be found on the City of Des Moines’ website.